A multi-angle rearview camera with guidelines and in-dash display screen comes standard with optional dynamic guidelines available on select trims. The Honda Sensing system includes features like Lane Departure Warning, Road Departure Mitigation, and Collision Mitigating Braking for extra security on busy roadways. A suite of advanced airbags, including front side airbags and side curtain airbags with rollover sensor protect passengers from harm in a crash. A right-side camera displays a view of the passenger lane on the in-dash touchscreen to help avoid merging accidents. Every Honda Civic in our inventory comes loaded with a suite of active safety features that includes Vehicle Stability Assist with Traction Control, anti-lock brakes (ABS), Electronic Brake Distribution, and Brake Assist. These features work together to help ensure that in even when faced with dangerous road conditions, the Civic can respond quickly and confidently. Other available features like Forward Collision Warning and Adaptive Cruise Control with Low-Speed Follow help to monitor the area in front of the vehicle, alerting the driver and even taking action if the driver fails to react in time. They’re what give Honda Sensing the advantage over Toyota Safety Sense. To experience the safety features and other features of the Honda Civic for yourself, drop by Brown Automotive Group. 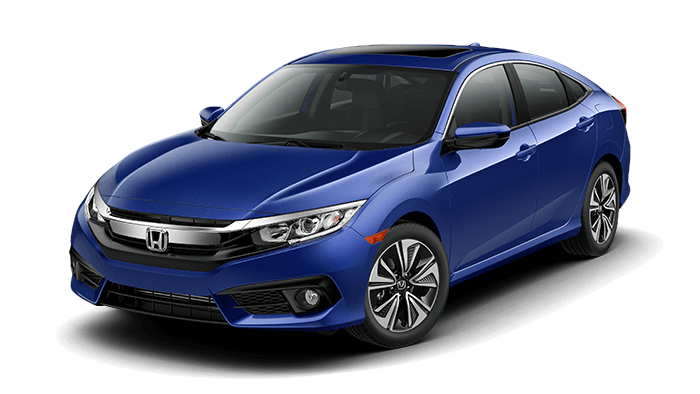 Take a test drive and learn how simple and affordable leasing or buying your favorite Honda Civic trim can be. Contact us to get started today.